“Machine-Readable Cataloging” [MARC] was expertly created by Henriette Avram in 1968 to standardize bibliographic information and to enable it to be “read” by and transmitted between computers. Although the field of knowledge organization will forever be indebted to Avram and her pioneering cataloging system that has since become an international standard, the LIS community has outgrown MARC, and seeks roomier quarters within which to continue, improve upon, and link cataloging processes. BIBFRAME has been presented as the next frontier in technological and knowledge organization advancements in cataloging procedures. 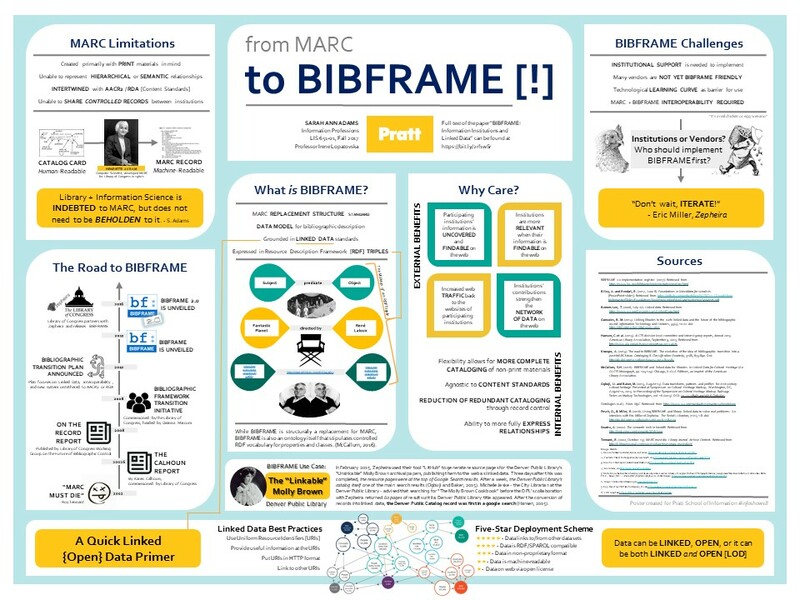 This poster seeks to briefly overview MARC’s limitations, the history of the transition away from MARC toward BIBFRAME, the functionality of BIBFRAME, and the opportunities and challenges presented by BIBFRAME. The full text of the accompanying paper “BIBFRAME: Information Institutions and Linked Data” can be found here. This paper was completed for Professor Irene Lopatovska’s Fall 2017 Course LIS-651 Information Professions.